SIHH 2014: A. Lange & Söhne Lange Zeitwerk Striking Time in Pink Gold. Live Pictures and Pricing. Up until now only available in platinum or 18K white gold, this year at the SIHH 2014, A. Lange & Söhne presented the Lange Zeitwerk Striking Time in 18K pink gold ref. 140.032. Three high-pitched chimes and one lower-pitched tone are the sounds with which this fascinating watch announces each passing quarter and full hour. The first A. Lange & Söhne wristwatch with a chiming mechanism is now also available in pink gold. A. Lange & Söhne amazed the watch collecting world when it presented the Lange Zeitwerk Striking Time three years ago. Now, the resonant masterpiece with precisely jumping numerals is also available in pink gold with a silver dial and pink gold hands. With a case measuring 44.2 mm in diameter this watch has perfect proportions and a striking design. In the Lange Zeitwerk Striking Time, key chiming mechanism components are visibly integrated into the dial design. The black-polished steel hammers can be seen on either side of the subsidiary seconds dial: one on the right for the quarter hours and one on the left for the full hours. The two gongs, embedded in a recess between the dial and bezel, are also readily recognizable. Every 15 minutes, the mechanism triggers the striking of one of the two gongs. The chiming mechanism can be deactivated to prevent any disturbance during the night or at a meeting with a push piece at 4 o’clock that raises the hammers and silences the watch. 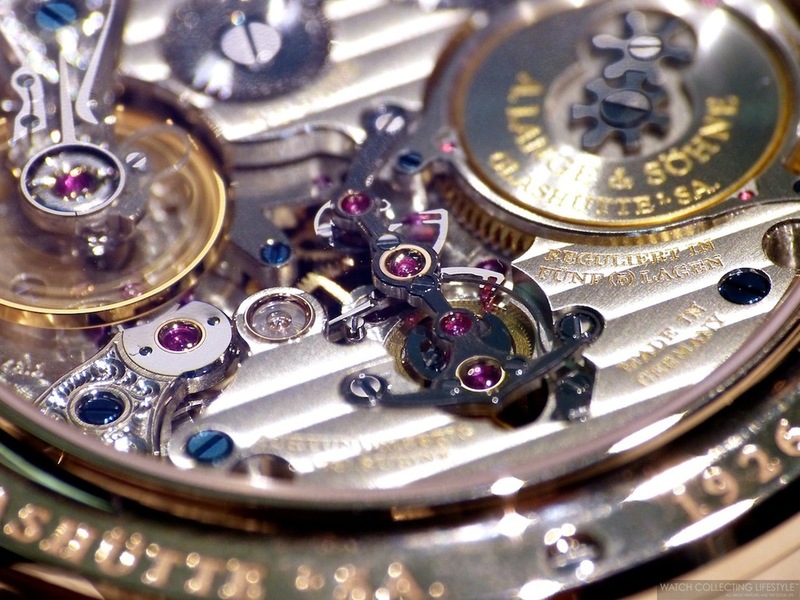 The heart of the Lange Zeitwerk Striking Time, the L043.2 manufacture calibre, fulfills all those expectations that watch connoisseurs legitimately associate with the name A. Lange & Söhne: its assets include the lavish decoration of all movement parts by hand as well as the balance wheel with eccentric poising weights and a proprietary Lange balance spring. This amazing calibre is composed of 528 parts, 78 jewels, two screwed gold chatons and provides a power reserve of 36 hours when fully wound. With its precisely jumping numerals display, the new member of the Lange Zeitwerk family also represents lucid design and crisp legibility. The large numerals of the adjacent hour and minute indications enable the current time to be read clearly. In fractions of a second, the patented constant-force escapement advances the numerals minute by minute until the full hour when all three numeral discs jump forward simultaneously by exactly one increment. The Lange Zeitwerk Striking Time enriches the exciting interplay of numbers with a unique tone in a quarter-hour cadence for the wearer’s listening pleasure. In all a fantastic complication with exceptional wrist presence. Sticker Price 48,500 Euro. For more info on A. Lange & Söhne click here. Posted on January 28, 2014 by Editor & Publisher and filed under A Lange Sohne, SIHH and tagged ALS Lange Zeitwerk Striking Time A. Lange & Sohne Lange Zeitwerk Striking Time A. Lange & Sohne ref. 140.032.